Down to One Horse. Again. Have you noticed that life—with horses and otherwise—doesn’t always go as planned? I had settled into the comfortable fantasy of living with my two Paint geldings, Wally and Joey, until they met a peaceful ending twenty years or so from now. So much for dreams. Don’t get concerned. Neither of my “boys” passed away. But one of them is gone. And it happened very suddenly. Two weeks ago my life with horses was merrily on course. Then my husband Ron got some alarming news from his doctor. He was going to need surgery, and it was going to have a rather lengthy recovery period. Surprise! The whole experience felt rather surreal, especially when one of the nurses casually related that she had a grulla mare she showed in cutting with Bob Avila. It was like both of my worlds colliding in one swirling mess. After much contemplation, I made the decision to sell one of my horses. It was the most reasonable option. Because of this surgery, Ron will have to cut back on his work hours for a while. Having one less horse to feed and shoe would ease the strain on our budget. It will also allow me more time to care for Ron. Honestly, despite my obsession with riding and barn chores, I actually do want to look after my husband. Ron has been an extremely supportive partner. Besides my riding accident, which left me in chronic pain and some disability in my right arm, he has also helped me through a decade-long struggle with a bone infection and a miscalculated brain surgery that temporarily paralyzed one side of my face. Plus he indulges my wacky love of horses. How can I not be there totally, unconditionally, for him? My dilemma, however, was deciding which horse to let go. Wally the Wonder horse, whose tough demeanor was mostly bluff, and masked the fact that he was a bold, keen horse under saddle? Or sweet-tempered Joey who greeted each day like it was a birthday party? It ended up being Joey. The woman I’d bought him from a year ago had always regretted selling him. She had bred and raised him and shown him in halter classes. Last summer she’d stopped by my house and remarked how much she missed him. “Please, Cindy, if you ever need to sell him, call me first. I’ll buy him back,” she said. So called her. And she did buy him back. I was supremely fortunate. It was like an answer to a prayer. Joey didn’t have to go to a stranger. He went right back to his Original Mom. Trust me, I did pause and wonder how horse owners who didn’t have a ready-made buyer found new homes for their horses, especially in this economy. What would a desperate seller do? How could they place their cute little horse when there are already so many unwanted horses out there? Life with horses can really be tough sometimes. Now I can commiserate with horse lovers who have had to make the tough decision to sell a nice horse. Even though I know Joey went to a great home, it was difficult to see him being led away. I watched the way he happily sauntered to the ramp of the trailer, as if he were excited to be heading off on a new adventure. His apple-shaped rump shone like polished copper in the crisp sunlight and his sorrel tail sashayed like a wide ribbon banner. I closed the iron gate to my driveway and heard his hooves clip-clop across the asphalt one last time. And then I cried. I’m so sorry you had to let Joey go 🙁 But how lucky your husband is to have someone like you looking out for him. Hope it all works out for the best. I too have been there with having to sell a family member ( of the horse kind) because of finances , arrival of child #3 ( a 4 yr old and 2 yr old already at home) and knowing i just wouldn’t have the time to give to all the horses I had at home. We do recover as you know and it helps that joey went to a former loving home. I hope all goes well with your husbands surgery and recovery. I, too, once sold my horse when my husband was diagnosed with cancer. Like you, I was lucky enough to find him a good home immediately, with my vet’s wife, which made it bearable. I was horseless for two years, and then was able to buy another horse once things stablized at home. Good luck as you face life’s new challenges. I’m sorry that you had to sell him. But he did go to a good home; and you still have Wally. The lady that I brought my Appaloosa from said that if I have had to sell him, to call her first. I’m so sorry! It sounds like you made the right decision, though. I hope you can keep in touch with Joey. hi, Cindy, I know how you feel, my friend has 2 horses and her husband has health problems so she has to sell both. Think of it this way, you still have one! I was also wondering, where did you get your saddle or what brand is it? I am looking for one and really liked the one in the picture. I am so sorry about your husband, I hope he has a speedy recovery. Also sorry about Joey. I know it is hard to let them go, but he will have a wonderful life. Even though a part of your heart went with him. Oh Cindy, sorry your husband isn’t well and I hope he has a speedy recovery. I’m also sorry about Joey. I had to sale four of mine years ago, I cried like a baby. At least you know where and to whom he is going. THANKS FOR ALL THE KIND THOUGHTS. I SHOULD BE ABLE TO SEE JOEY ONCE IN A WHILE, AS HE’LL BE RIDDEN ON THE LOCAL TRAILS SOME OF THE TIME. I KNOW SOME PEOPLE ARE WONDERING JUST WHAT’S WRONG WITH RON. HE HAS PROSTATE CANCER. WE ARE VERY FORTUNATE THAT IT WAS DETECTED IN THE EARLY STAGES. I COULDN’T IMAGINE BEING WITHOUT HIM. I’D BE ONE LONELY HORSEWOMAN! ALEXA,THE SADDLE IN THE PHOTO IS A REINING SADDLE I USED ON JOEY. IT’S A “BILLY COOK MAKER” SADDLE, NOT TO BE CONFUSED WITH THE OTHER BILLY COOK BRAND OF SADDLES. THERE’S SOME STORY ABOUT HOW THE BILLY COOK NAME WAS SOLD TO ANOTHER SADDLE MAKER, BUT I’M NOT CLEAR ON THE DETAILS OR THE IMPLICATIONS. ALL I KNOW IS THAT I REALLY LIKE THIS SADDLE! I ALSO HAVE A CRATES REINING SADDLE. THAT ONE FITS WALLY BEST. 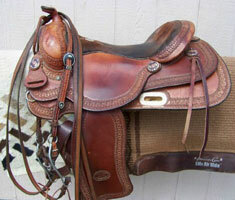 I KNOW EVERYONE HAS THEIR PREFERENCES WHEN IT COMES TO WESTERN SADDLES. I HAPPEN TO LIKE REINING SADDLES: THEY’RE A CLOSE-CONTACT DESIGN, SO IT FEELS FAMILIAR TO ME, SINCE I RODE HUNTSEAT FOR SO LONG. THERE’S NOT A TON OF LEATHER BETWEEN ME AND MY HORSE. WOW! THAT WAS A LONG REPLY. IT WAS ALMOST LIKE A WHOLE NEW BLOG POST, LOL!